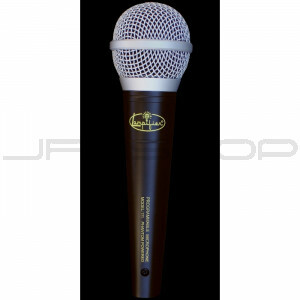 The model 111 Lampifier microphone is a unidirectional super-cardioid dynamic microphone for professional sound reinforcement or recording. Applications include professional vocal performance, public address, and musical instruments. A phantom-powered sound processor is located inside the microphone’s handle. The processor is programmable and improves sound quality for a wide variety of applications. Total system cost is dramatically reduced by including the audio processor internally. No extra patch cables or outboard sound processors are required. The audio processor inside the microphone is pre-programmed for the user’s application to deliver a polished, professional sound right out of the box. The processor self-adjusts to the incoming sound, making program adjustments by the user generally unnecessary. The user also can reprogram the processor to use the microphone in different applications or customize it for the user's personal style or preference. The Model 111 features a tailored vocal/instrument response following the well-defined industry standard of an upper midrange frequency boost for professional vocal microphones. As a result, this microphone is an excellent choice for relatively close sound source mic’ing (singing or speaking closer to the microphone). This is because even with a full proximity effect bass boost, the upper midrange can still “keep up,” providing a solid, projected tone. As a further enhancement, a bass-boost ring is included to enable even more fine-tuned adjustment of the proximity effect. A built-in spherical filter minimizes wind and breath "pop" noise, while a super-cardioid pickup pattern isolates the main sound source and minimizes unwanted background noise. A rugged construction ensures that the Model 111 will perform consistently and reliably. This microphone is most often used in moderate to high volume environments, which is consistent with it’s favorability for close mic’ing. Includes microphone with preprogrammed sound processor, microphone carrying bag, user guide, programming guide, and six extra shunts for programming.